More than 400 people attended the wedding, billed as the social event of the year. 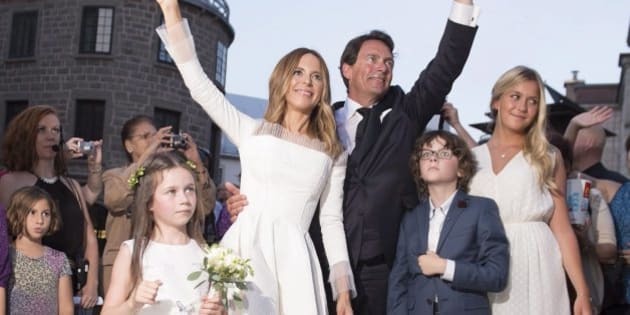 Parti Quebecois Leader Pierre Karl Peladeau had to wait for his bride, but the province's most publicized couple tied the knot at 7:45 pm Saturday at the historic Musee de l'Amerique francophone, a museum dedicated to francophone culture in North America. The bride, television host and producer Julie Snyder, arrived 75 minutes late to the ceremony, pulling up in an electric car driven by ex-Environment Minister Daniel Breton to join her bethrothed, media mogul Peladeau. Dressed in a cream-coloured gown by Jean Paul Gaultier, Snyder blamed her lateness on the fans who approached her on her journey from her hotel to the museum. "There were a lot of people and I thought the least I could do for the people who waited for me to come out of the hotel and who were there for the trip was to take a few photos with them and to greet them,'' she explained upon arrival. She wasn't the only one. Even after 14 years as a couple, her future husband admitted to feeling feverish before the ceremony. Pulling up to the ceremony on a tandem bicycle with his son Thomas, a fleur-de-lys floating in the wind, the Parti Quebecois Leader and principal shareholder of the Quebecor media empire refrained from political statements. "Listen, we aren't going to do politics today except to salute National Acadian Day,'' he said. More than 400 people attended the wedding, billed as the social event of the year, including a number of local music and television stars including Michel Barrette, Guylaine Tremblay, and Michel Rivard -- as well as numerous Parti Quebecois members. Bloc Quebecois Leader Gilles Duceppe took a break from the federal election campaign to attend the wedding with his wife Yolande, accompanied by former Premiers Pauline Marois and Bernard Landry and their spouses. Duceppe declined to cast the event in a political light. "I didn't come for that, I came out of friendship,'' he said. Landry was less discreet, calling the union a "powerful symbol'' for the sovereignty movement. Quebec City Mayor Regis Labeaume attended and performed the ceremony. Montreal's Mayor Denis Coderre also made the trip. "I know Julie Snyder, I know PKP, they invited me to the wedding and it brings me pleasure to be here,'' Coderre said. ``And I came to see how my friend Regis will do as an officiant; I did three (marriages) at City Hall earlier,'' Coderre said. Quebec showbiz was in attendance with performances from Marie-Mai, Jean-Pierre Ferland and Eric Lapointe, with Claude Gauthier and Paul Piche also taking part. Singer Ferland, who performed at the ceremony, had some advice for the newlyweds. "Don't divorce too quickly,'' he said with a laugh. Before the glamorous evening, the guests ate a vegetarian meal with Quebecois, First Nations and Thai dishes. An effort was made to ensure only Quebec products were served. Quebec singing star Celine Dion, who is planning to return to the Vegas stage and who is caring for her ailing husband Rene Angelil, was not able to attend. She nevertheless appeared in a video message introducing a singing performance by Romy, Peladeau and Snyder's daughter.